Metal Fabrication Glossary | Fort Miller FAB 3 Corp.
Not a day goes by that we at Fort Miller FAB3 don’t think about metal fabrication. It’s our craft, our art, our livelihood, and our passion. We realize, however, that this is not the case for all people. Though we are all familiar with metal and its various uses, we know that many people aren’t entirely sure what exactly fabrication is. This is in part because metal fabrication entails many processes, tools, and concepts that are not apart of the average person’s everyday life. 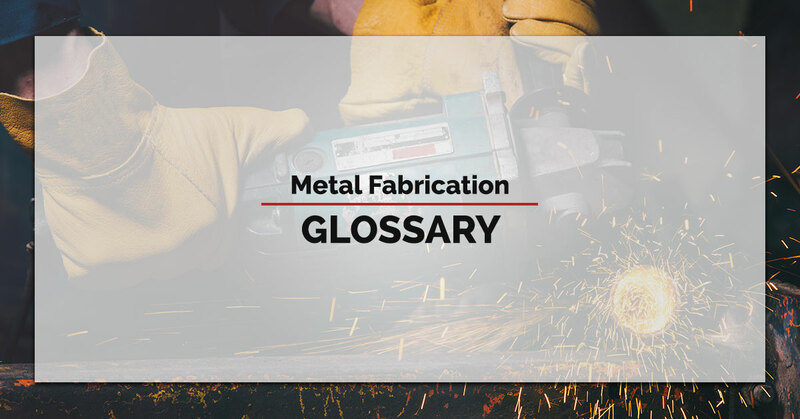 To help you better understand what metal fabrication is, we would like to share with you a glossary of basic, industry-specific terms and phrases. If you are in need of metal fabrication, robotic welding, plasma cutting, or any other fabrication service, contact our New York metal fabrication shop today! ARC Welding – Joining metal to metal by using electricity to melt metal that creates a strong bond once cooled. Assembling – The process of binding, bending, and welding materials into their desired form. Base Metal – The original metal that is to be welded, cut, or manipulated. Bending – The process of using hammering or press brakes to coin or air-bend metal sheets into their desired shape. Blanking – The process whereby a part of sheet metal is cut out and the excess material around the part is discarded. Brinell Test – A test performed to determine the hardness of steel. The test involves pressing a hard steel ball into the material being tested and measuring the diameter of the mark left. CNC Cutter – Serving as a more reliable and precise alternative to manual machines, computer numerical cutters (CNC) are automated machine tools that can be programmed to deliver precise commands. Read more about CNC Machining here in a past blog. Cutting Torches – Tools used to cut a large section of sheet metal and other materials with little effort. Fab Shops – A shortened term for a metal fabrication shops. Hydroforming – A fabricating process that uses highly pressurized fluid to shape metals like steel, stainless steel, aluminum, copper, brass, and more. Laser Cutting – The process of using highly concentrated beams of light to pierce and cut through materials via extreme heat. Laser machines provide waves of light that are consistent in phase, frequency, and direction. Though original laser cutting was done with carbon dioxide, in recent years fiber-optic lasers have become increasingly more utilized. Need laser cutting? FAB3 uses state-of-the-art laser technology to complete jobs of any size and virtually any material. Contact us to learn more. Metal Fabrication – The building of metal structures through the process of cutting, bending, and assembling metal. Metal Punching – When metal fabrication equipment punches holes, louvers, or other shapes into metal. Milling – The process of using rotary cutters to shave or remove material from metal. Plasma Cutting – The process of cutting through materials (often sheet metal) by means of hot plasma. Looking for professional plasma cutters? Contact FAB3! Plasma cutting is one of our specialties. Press Brakes – A machine tool used for bending metal, most commonly sheet metal. To achieve different forms, different die designs are utilized. Common dies include v-dies, gooseneck, rotary bending dies, acute angle dies, radius dies, etc. Robotic Welding – Welding performed by programmed technology and sophisticated equipment. Perfect for volume welding a variety of steels and when consistency and precision are crucial. Roll Forming – The bending of metals to form a new shape by passing sheet metal, coils, bars, or strips of metal through rolls. Sandblasting – The process of blasting surfaces and removing unwanted coatings and coverings including rust, oxidization, paints, and more. This is perfect for paint preparation and material restoration. If you are in need of professional sandblasting, contact FAB3. We have the experience and equipment to handle a range of blasting techniques. Weld Pass – The single progression of a weld along a joint or substrate. Yield Point – The point in the bending process when a metal or other material permanently deforms. Metal fabrication involves many tools, processes, and skilled professionals. At FAB3, our fabrication experts take great pride in their ability to tailor their creations to your exact needs. From laser cutting to robotic welding to CNC machining, we do it all. Check out some our popular services here. Contact us today to discuss your project and find out how we can help.